A lot of salad dressing comes in a squeezable bottle with a little hole in the top that it squirts out of. This seems to work much better than the old glass bottles with the giant hole at the top. The problem is every once in awhile there will be a bottle that is squeezable but still has the full size hole. Of course, this isn’t something you are likely to notice until half of the bottle has been emptied onto your salad. I lol’d and my dad wondered about it, so I showed him the comic. He doesn’t look too happy about it. 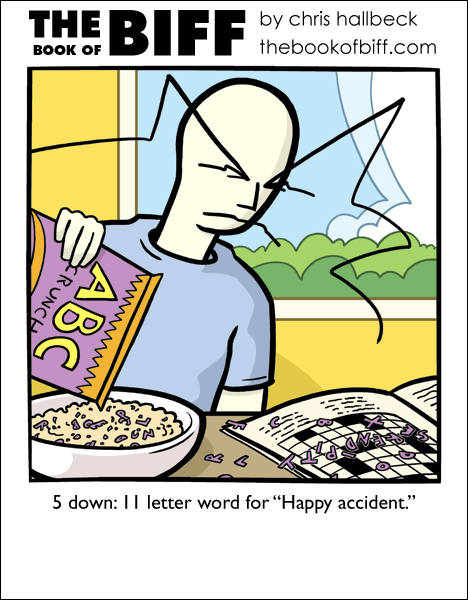 I guess it’s no fun when your cereal does your crossword puzzle for you. @Mad David: I guess Biff never looks happy. This is kinda sad. never seen somone actually use the word serendipity before, congratulations on obscure uses of rare words! I hate that about salad dressing bottles. I think the dinner table is the last place I want such a degree of risk. And then there’s the squeeze bottles like certain brands of blue cheese that are thick enough to pop the plastic insert out. So now you’ve got half a bottle of dreassing /and/ a piece of plastic in your salad. Actually, Serendipity is my favorite romantic comedy. Haha, my grandma would find this one funny. XD She does crosswords all the time and hates the long words. Bigger holes means more comes out, even if you want a little. It’s a diabolical marketing plot to get you to buy more salad dressing! That would be my guess, Nilly. I hate it when I get too much salad in my dressing. Salad dressing is a non-Newtonian fluid. Which is fancy talk for “Murphy’s Condiment.” If the salad dressing *can* go wrong, it *will* go wrong. @Kree – It’s a conspiracy! @Chris: it actually is. I believe a guy once actually won a lot of money (don’t remember if it was a competition or what) for coming up with the idea of making toothpaste-tube’s hole bigger. Starseedjenny: I was just about to post that. xD My parents and I were wondering about that when I got a ranch squeeze bottle without the little hole at the top. Then I screwed the cap back on, took it back off, and voila! Magic trick! A delicious cycle. Kind of like nacho cheese and nacho chips. Oh, nacho cheese and nacho chips. I hate that. Everytime I get them, the cheese goes wrong somehow. Either too much or too little or it makes the chips soggy. I would like cereal that did my crossword puzzles for me, they are so confusing. thus leading to c) everyone thinking I’m mad. Unfortunately, I am already mad, so there’ll be more witnesses when it comes to the reading of my will in, I hope, a very long time. @Heatherface. Bob Ross FTW. He freaked me out a little when I started watching him on PBS, lo, those many years ago, but he made me believe I could make those “happy little accidents” too. @AdmiralChaos – I’m the same way with salads. Surprisingly, however, Ranch is the only dressing that I can do that with. If I put too much of anything else, I just let it sit at the bottom of the bowl, eat my salad, then dump the remainder of dressing into the sink. One that happens a lot to me is Salsa, specifically Pace with their goofy container. If I tip it just a few degrees too far, I’m suddenly greeted with a bowl and a half of salsa that I now have to eat, or spend the next few minutes trying to spoon the salsa back in. Lucas Turnbloom made a very similar joke about serendipity today in his Imagine This comic… I sense a conspiracy! “Serendipity” is a regular part of my academic vocabulary – meaning I’ll use it frequently in papers or with professors but rarely with friends. I blame my various film studies courses that can’t get over those “serendipitous” moments in various productions. I hate getting too much dressing, but I just add salad. Then I never seem to have enough dressing but when I add more I always seem to add too much, then I add salad but thenI never seem to have enough dressing but when I add more I always seem to add too much, then I add salad but thenI never seem to have enough dressing but when I add more I always seem to add too much, then I add salad but thenI never seem to have enough dressing, it’s a rough cycle to break out of. I’ve spent entire days trying to get the food to come out even and I eat way too much and end up getting sick, then I find myself hungry again and a salad always sounds good, but I always seem to put on too much dressing, but I just add salad . . .
Pazno — I ain’t saying nuthin! Man, if that ain’t a fluke I don’t know what is!